Experience one of the world’s most pristine wilderness settings on this adventure trip to Patagonia. With specialized guides you get to know in detail this paradise through diving, sea kayaking, hiking, boat excursions and glacier walking. Discover Puerto Madryn and Puerto Deseado (the treasure trove of wildlife), encounter the Perito Moreno Glacier and hike El Chalten and Glacier Park. Explore Cueva de las Manos and Bosque Petrificado or the Stone Forest. Discover Nature Patagonia is the perfect trip for you outdoor enthusiasts who want to actively experience this remarkable part of the world. Upon arrival at the airport in Buenos Aires, you transfer to the domestic terminal to board your flight to Trilew. You will be met by our representative at the airport outside ground transportation and driven to your accommodations in Port Madryn. Tonight you meet your guide and the rest of the group for an orientation about the trip at a welcome dinner. After breakfast, meet with your guide and discover the Port by a diving adventure. In the afternoon, sea kayak to Punta Loma Sea Lions Roquery. Enjoy lunch and dinner at your hotel (included). Puerto Madryn is located in the Patagonian province of Chubut, Argentina. A deep water port, a commercial center, and a tourism destination, Puerto Madryn is a popular resort destination for travelers to enjoy beaches, sports and wildlife excursions. Puerto Madryn is also the gateway to the Península Valdés, a wildlife sanctuary for birds and marine species, including flamingos, whales, sea elephants, sea lions, Magellanic penguins, cormorants, petrels and many other species of wildlife. Punta Loma Sea Lions Roquery is a sea lion reserve 17 kilometers southwest of Port Madryn. We embark on a morning drive to Peninsula Valdes for a full day exploration which includes whale watching on board in Puerto Piramides. Visit Playa el Doradillo. The only town on the Valdes Península, Puerto Pirámides is one of the premier whale watching destinations in the world. One of six nature reserves along the península, the Punta Pirámide reserve was established in 1974. Its name was for the numerous pyramid-shaped cliffs that overlook the inlet. Playa el Doradillo’s headlands northeast of Port Madryn with its deep water is the best place to see whales as they approach the shore and the next best way after a whale watching boat excursion. Today we take a bus to Puerto Deseado via Comodoro Rivadavia. This is a long day. Lunch is a box meal and dinner will be at your hotel (included). Comodoro Rivadavia is an affluent city in southern Argentina located on the San Jorge Gulf, an inlet of the Atlantic Ocean, at the foot of the Chenque Hill. Comodoro Rivadavia is the most important city of the San Jorge Basin. Originally called Port Desire, Puerto Deseado is a city on a fishing port in the Santa Cruz Province of Argentina, Patagonia on the estuary of the Deseado River. It was named Port Desire in 1586 by Thomas Cavendish after the name of his ship, and later became known by the Spanish translation of the name. Today, the town has a couple of pleasant squares, a former railway station and two museums, one with a collection of indigenous artifacts and one at the seafront with relics from the Swift which sank in 1770, recovered after its wreck was discovered in the port in 1982. The coast boasts spectacular scenery and colonies of marine wildlife close to the town. After breakfast, we take an open sea journey to Isla Pinguino to see Penacho Amarillo Penguin colonies and sea lions. Lunch is a box meal and dinner will be at your hotel (included). Isla Pinguino was named in January 1820 during a British expedition under Edward Bransfield because penguins occupied the shores of the island. “Penguin Island” is capped by Deacon Peak, which was last thought to be active about 300 years ago. Petrel Crateris located on the east side of the island, and is thought to have last erupted in or around 1905. Today discover Puerto Deseado Ria by boat to see toninas, Magallanic Penguins, sea lions and Grey Cormorans. Enjoy spectacular panoramic views. Lunch and dinner included. Puerto Deseado Ria or River Deseado has become a haven wildlife lovers due to the high biodiversity of species all along its banks. It has been declared a natural reserve. We depart from Puerto Deseado to explore Bosque Petrificado National Park. Continue onward to Estancia. We stay in a hostel – lunch and dinner included. Bosque Petrificado National Park is known for its petrified wood, the name given to a special type of fossilized remains of terrestrial vegetation. It is the result of a tree or tree-like plants having completely transitioned to stone by the process of permineralization in which all the organic materials have been replaced with minerals (mostly a silicate, such as quartz). Today experience a full day of hiking to Estancia Cueva de las Manos and Rio Pinturas Canyon. We stay in a hostel – lunch and dinner included. Estancia Cueva de las Manos is a series of caves famous for its paintings of hands, a cave art which dates back from 13,000 to 9,000 years ago. The age of the paintings was calculated from the remains of bone-made pipes which are believed to have been used for spraying the paint on the wall blocked by the hand. Rio Pinturas Canyon is the location of Cueva de las Manos. Take an overland journey to El Carafate. We stay in a hostel – lunch and dinner included. El Calafate is situated in the southern border of Lake Argentino, in the southwest part of the Santa Cruz Province. Its name is derived from a little bush with yellow flowers and dark blue berries that is very common in Patagonia, the calafate or Berberis Buxifolia. 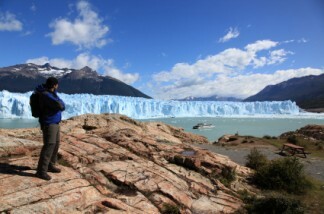 Today discover the Perito Moreno Glacier. This is a very impressive excursion. We stay in a hostel – lunch and dinner included. Perito Moreno Glacier is one of 48 glaciers located in the Andes system shared with Chile, is fed by the Southern Patagonian Ice Field . This icefield is the world’s third largest reserve of fresh water. The Perito Moreno Glacier is one of only three Patagonian glaciers that is growing today. Early morning departure to the El Chalten, Viedma Glacier Navigation and try ice walking. Lunch and dinner included. El Chalten is a small mountain village built in 1985 to help secure the disputed border with Chile. Today this village provides national park information for visitors, as well as accommodations, camping and backpacker dwellings. Viedma Glacier is a valley glacier that flows into the western end of Lake Viedma, which is fed primarily by its melting ice. Viedma Glacier, located in Los Glaciares National Park, was declared a World Heritage Site in 1981. We hike in El Chalten, visit the Cerro Torre Base Camp and Fitz Roy Viewpoint. In the afternoon we return to El Calafate. Lunch and dinner included. Cerro Torre is one of the mountains of the Southern Patagonian Ice Field located in a region which is disputed between Argentina and Chile, west of Cerro Chalten (also known as Fitz Roy). The peak is the highest in a four mountain chain. The top of the mountain has a mushroom of ice, formed by the constant strong winds, increasing the difficulty of reaching the actual summit. Monte Fitz Roy or Cerro Fitz Roy lies on the border of Chile and Argentina, near El Calafate. Francisco Moreno named the mountain in his book Viaje a la Patagonia Austral in honor of Robert FitzRoy, the captain of the HMS Beagle, who sailed up the Santa Cruz River in 1834 surveying the Patagonian coast. The mountain is also known as Cerro Chaltén, which means smoking mountain, because of the clouds that often form around the peak. Transfer to the airport for your morning flight to Buenos Aires. Afternoon bike tour the city. Lunch and dinner included. Transfer to the airport for your departure flight homebound or take our optional 4 Day Extension to Ushuaia.